DSCA’s mission is to advance U.S. national security and foreign policy interests by building the capacity of foreign security forces to respond to shared challenges. DCSA secured a 36 sq. meter space at Eurosatory with the main goal of creating private, high end space for discussions with international dignitaries. 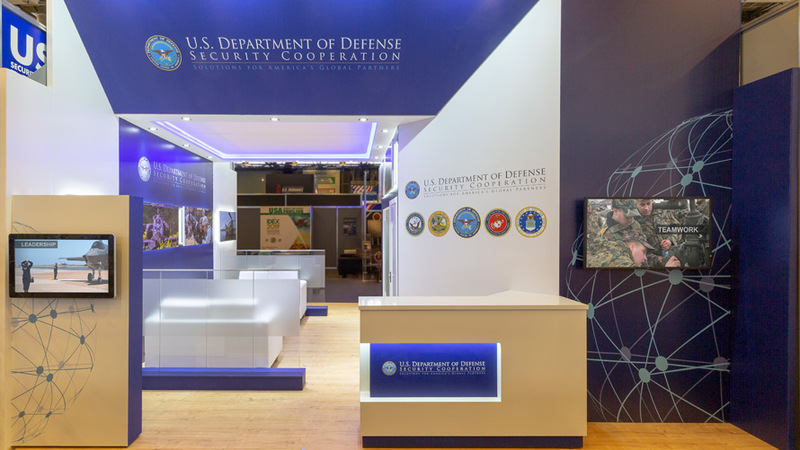 To start, we created large, custom headers with lighting and soffits instead of a hanging sign making a very impactful visual, and helping DSCA stand out in the US Pavilion. At the stand entrance, a custom reception counter with the US military seals overhead was a welcoming entrance. The military seals also created excellent photo opps for those attending. Upon entering, distinguished visitors went into a lounge area offering casual seating space for those waiting for their meeting to begin. The private meeting room included a photo gallery, custom lighting, modern furnishings, and a custom hospitality station. Throughout the exhibit were photo gallery-style graphics amplifying the message of the DCSA. 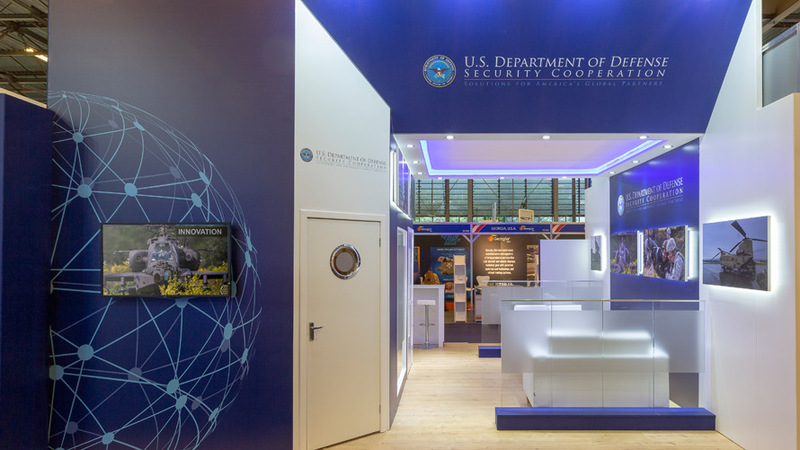 And for those not participating in meetings, an interactive kiosk was installed at the front of the stand, to allow visitors to get more information without entering the space.